When I feel like I need to take a little break and doing something special without the hassle of leaving the country, I love taking to the seas. Feeling the sea breeze on my face and relishing the carefreeness of the open sea never fails to rejuvenate me. 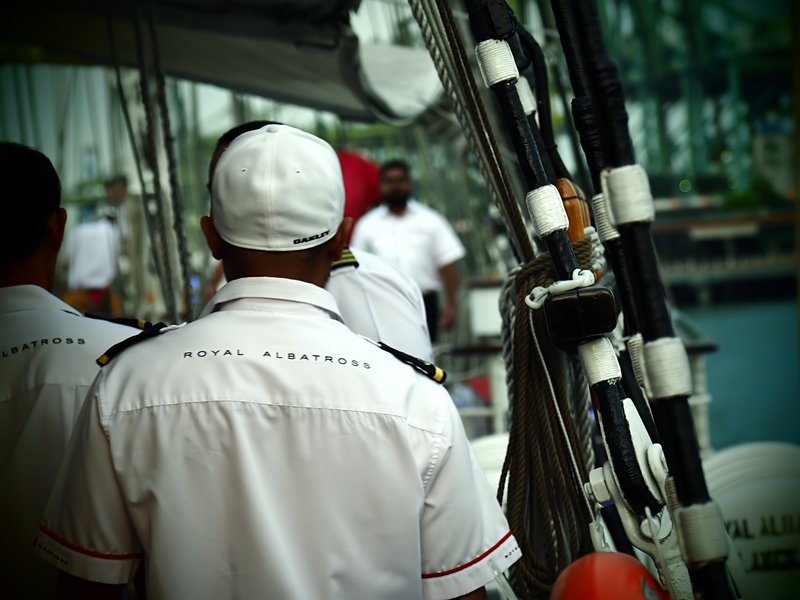 This time, I went on a sunset cruise on a special luxury tall ship named the Royal Albatross, which has its fame in The Dark Knight as Batman’s alter ego, Bruce Wayne’s private yatch. 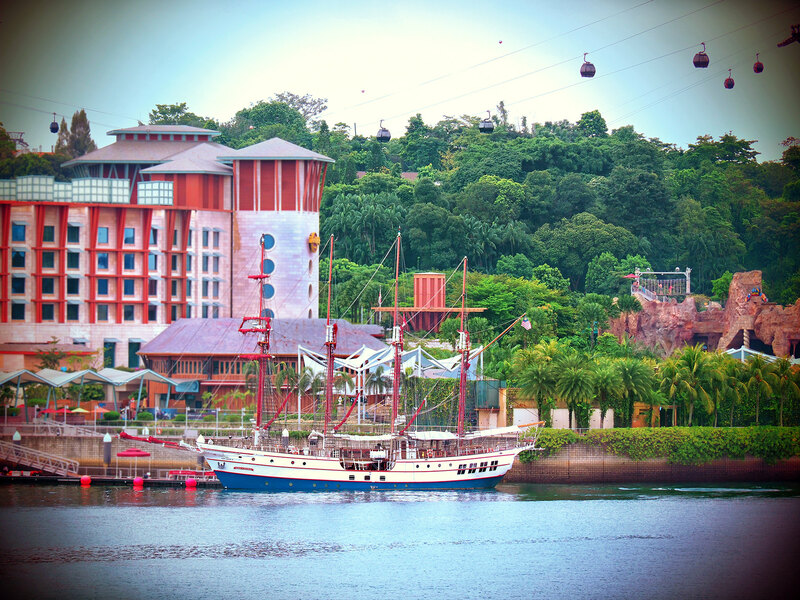 Docked alongside the Adventure Cove Waterpark at Resorts World Sentosa, it is a sight to behold, especially when it has all its 22 sails down. The sails and rigging were designed by master rigger Jim Barry, who also designed the ships featured in Pirates Of The Caribbean. 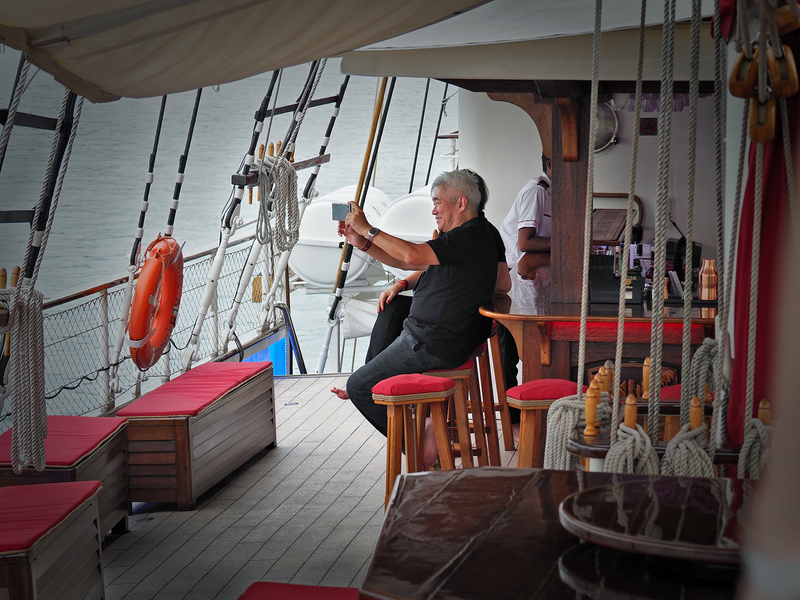 The Royal Albatross offers a 2.5-hour Sunset Sail cruise every Fridays, Saturdays and Sundays. 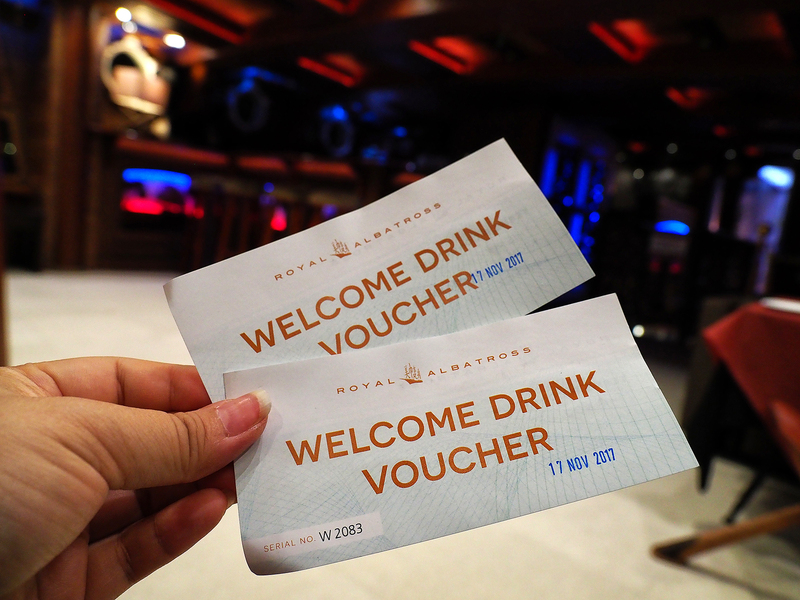 They also have additional cruises on festive days such as Christmas, New Year’s Day, St. Patrick’s Day and Mother’s Day. 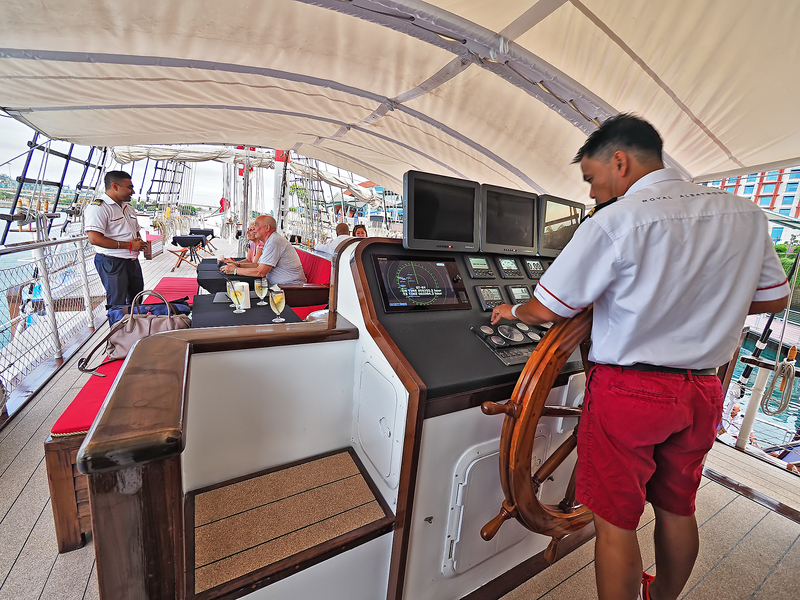 Of course, you can also hire the entire yatch, which has a maximum capacity of 130 people, on a private charter if you have something special to celebrate. 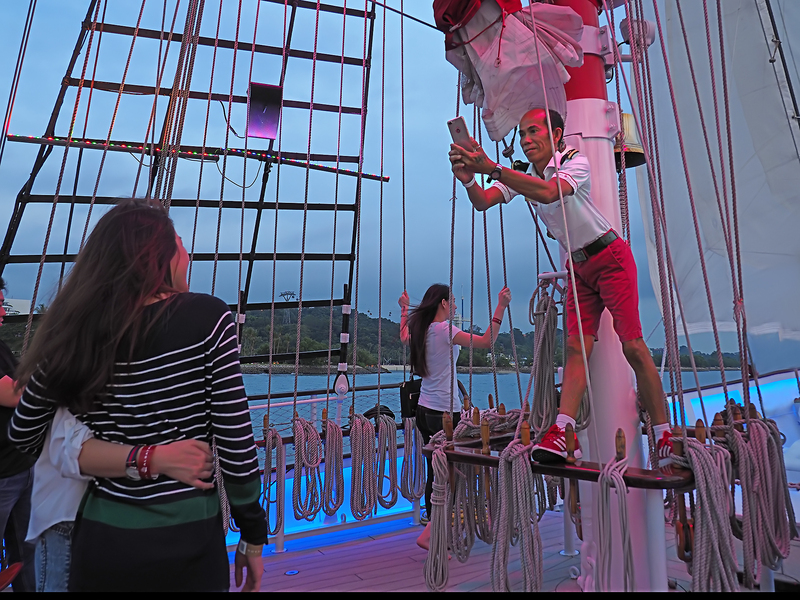 Guests were already excited and making selfies before the start of the cruise. Watching the crew getting ready to start the ship is pretty interesting. 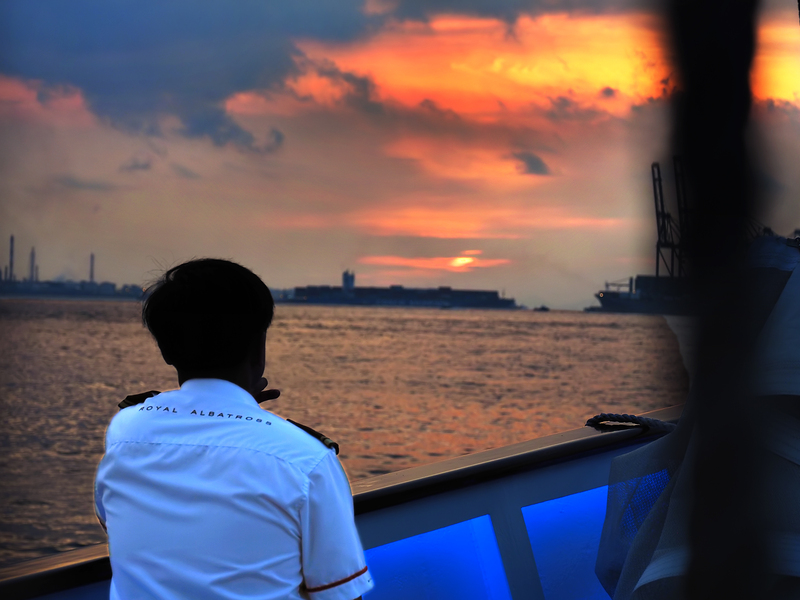 If you are brave enough, you can upgrade your cruise ticket to take the helm with the captain for 15 minutes. 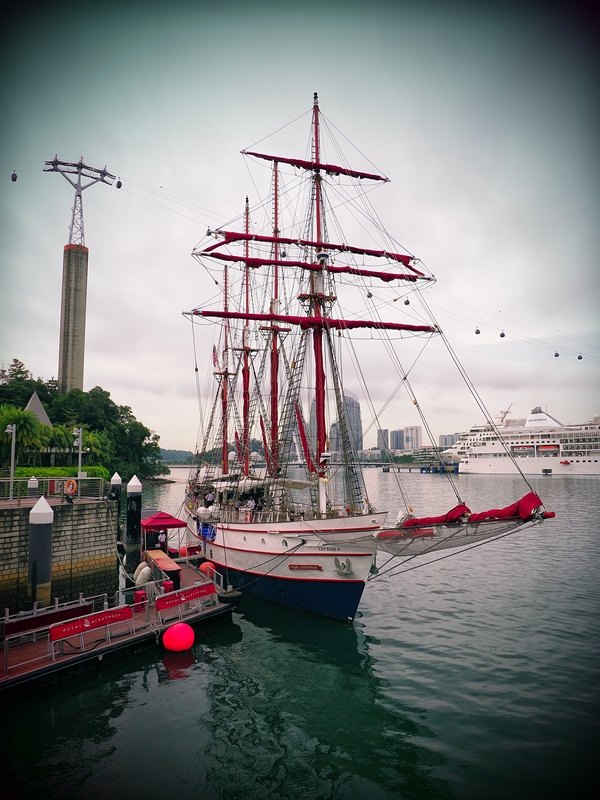 You can also fulfill your dream of being sailor (or pirate!) 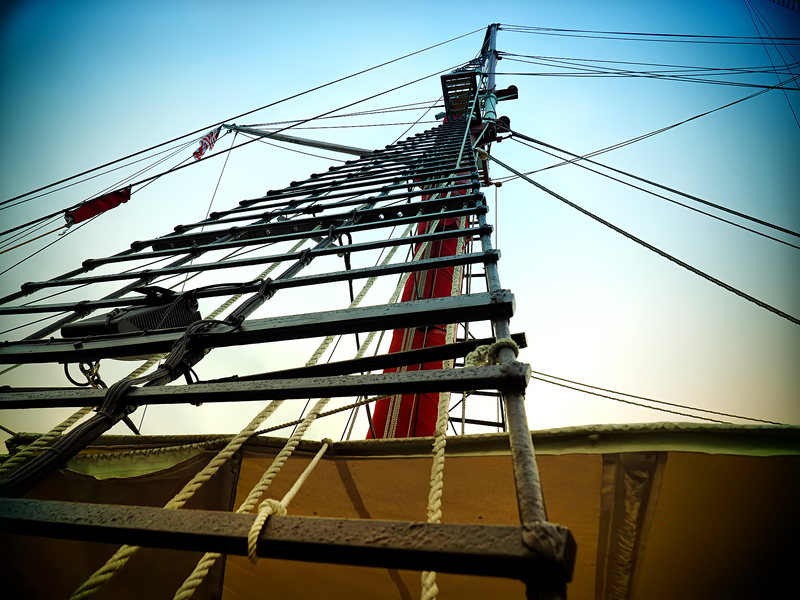 for a day on a Mast Climb. 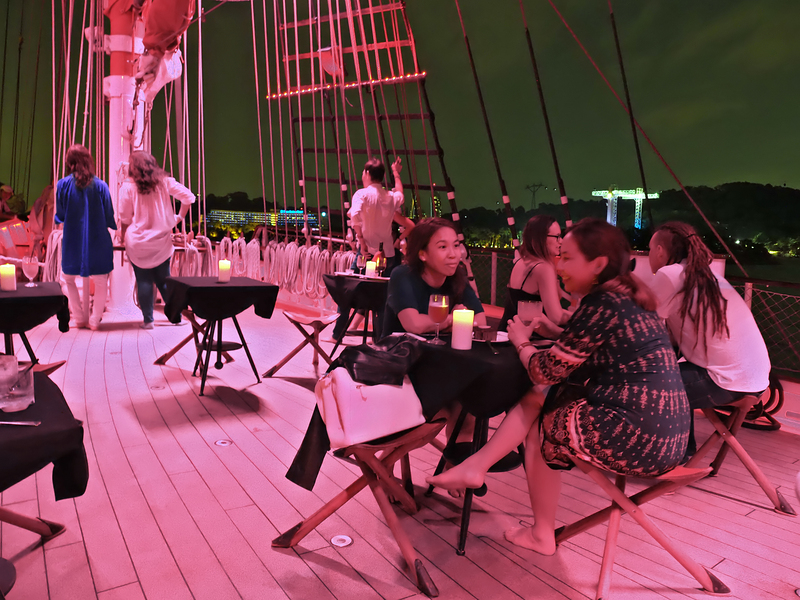 The ship’s 22 sails are all manually operated by over 200 ropes, and you get to climb on one of them, ascending 21 metres abover the ship deck where you can get a great view of Sentosa island. 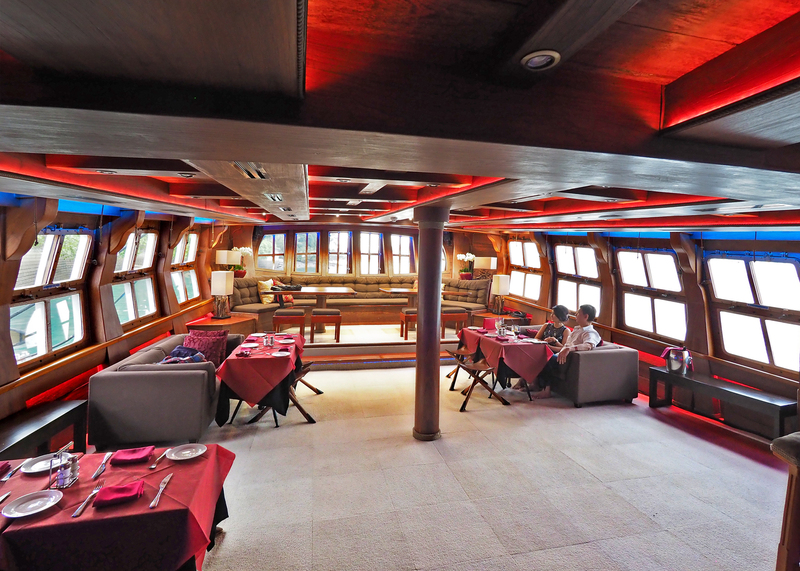 The luxurious air-conditioned Grand Salon on the middle deck where guests can relax and have their dinner. Definitely a winner for a romantic night out or cosy gathering with friends. Little bar by the side. 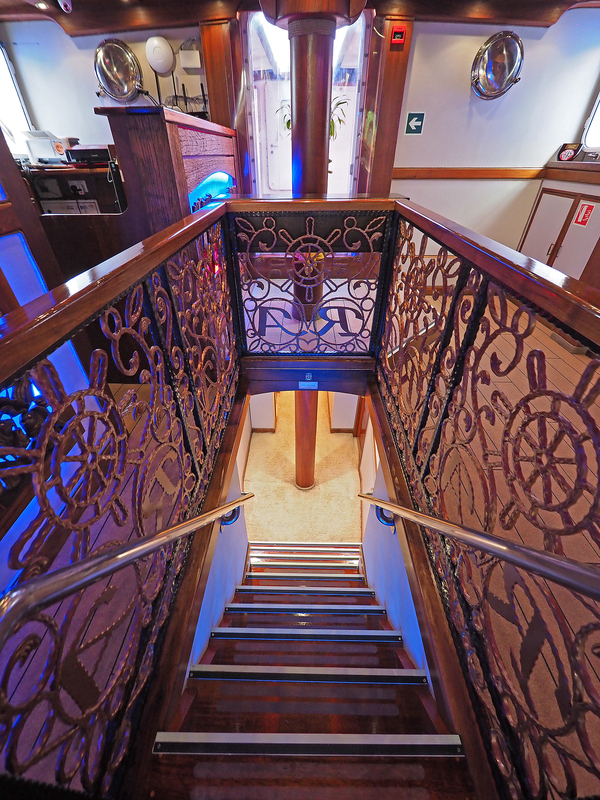 All the wood carvings were handcrafted by the crew during their free time. 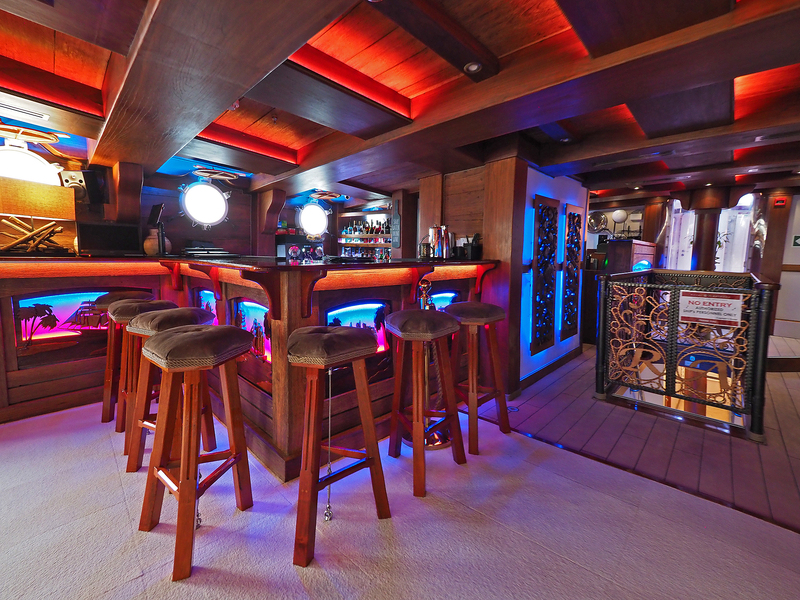 For an overnight charter, the yatch has 5 on-suite cabins which can take 10 guests. The spacious 40 square-metres Owner’s Cabin is the largest cabin. 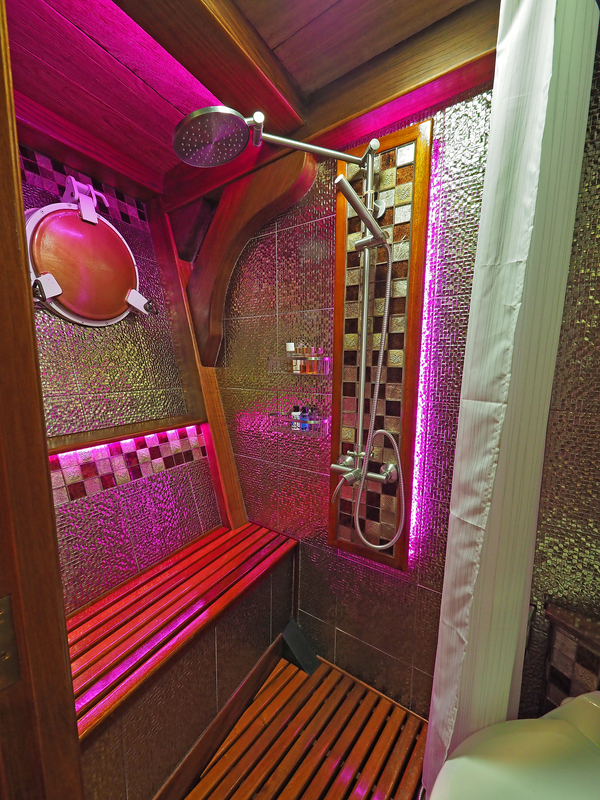 It comes with an oversized shower. One of the four smaller cabins. 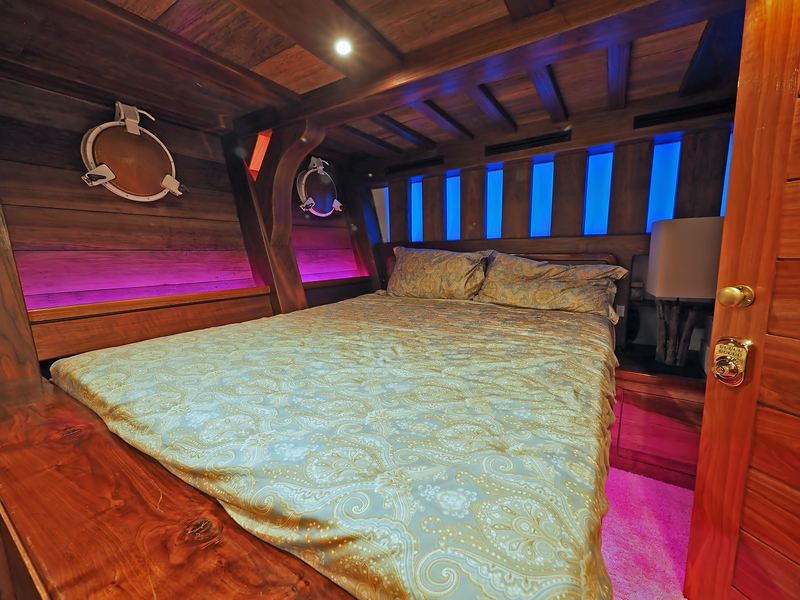 Looks cosy enough for a good night’s rest, if you are not out on the open deck taking in the beauty of the starry night skies. 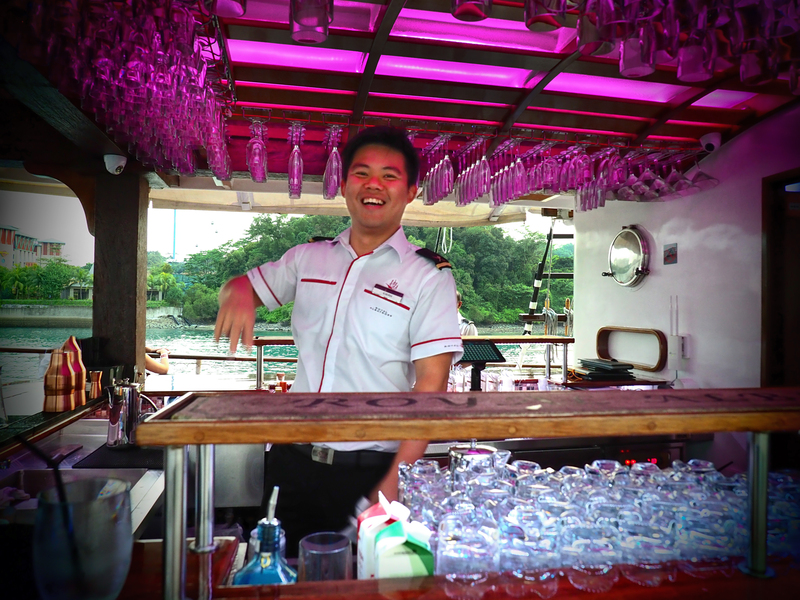 Each sunset cruise comes with a complimentary welcome drink. 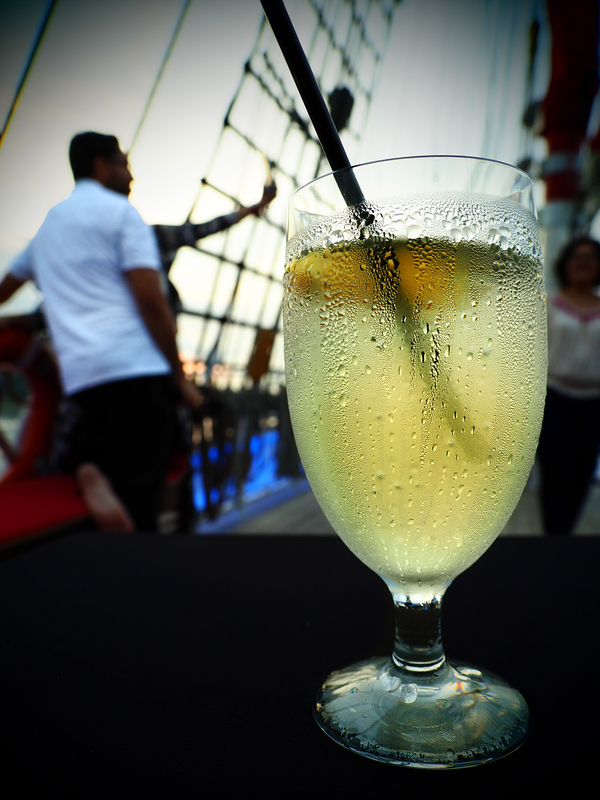 We had ours on the upper deck while waiting for a glorious sunset. The skies didn’t disappoint. And thank God for good weather. Going the extra mile to ensure guests get to keep the best memories. We need more people like him. 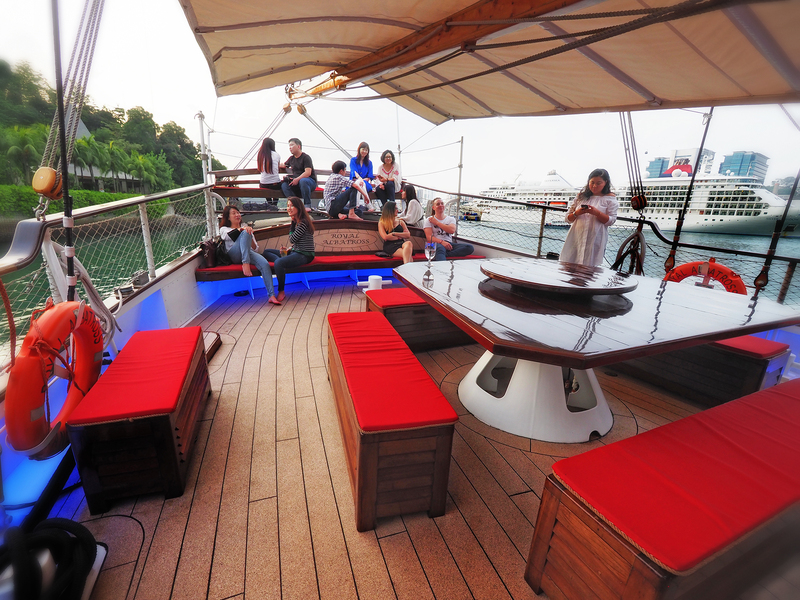 As night falls, the ship is lit by more than 60,000 LED lights, forming a warm ambience for guests to chillax on the upper deck. 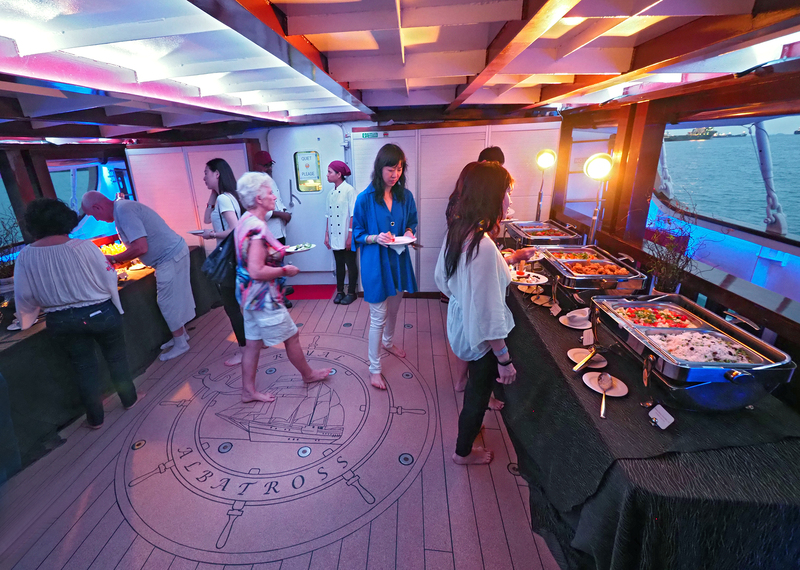 Buffet-style dinner, which is included in the cruise price, is served on the restaurant-grade galley. 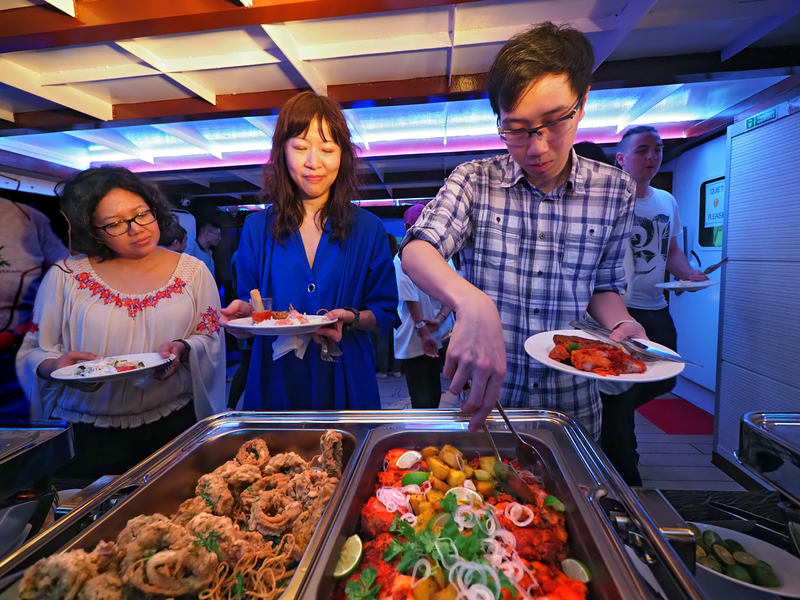 The menu was diverse to suit most palates. 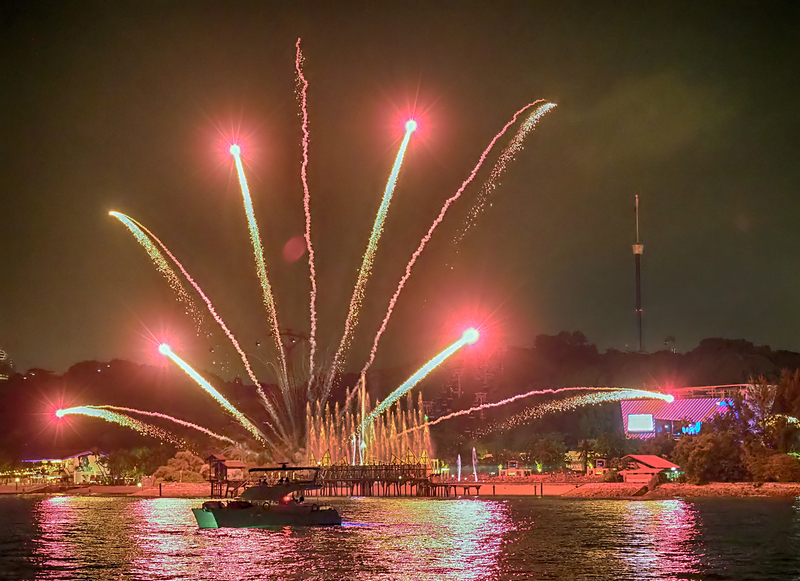 If you are lucky, you can catch a mini fireworks display on your way back to shore, courtesy of the nearby Universal Studios Singapore. 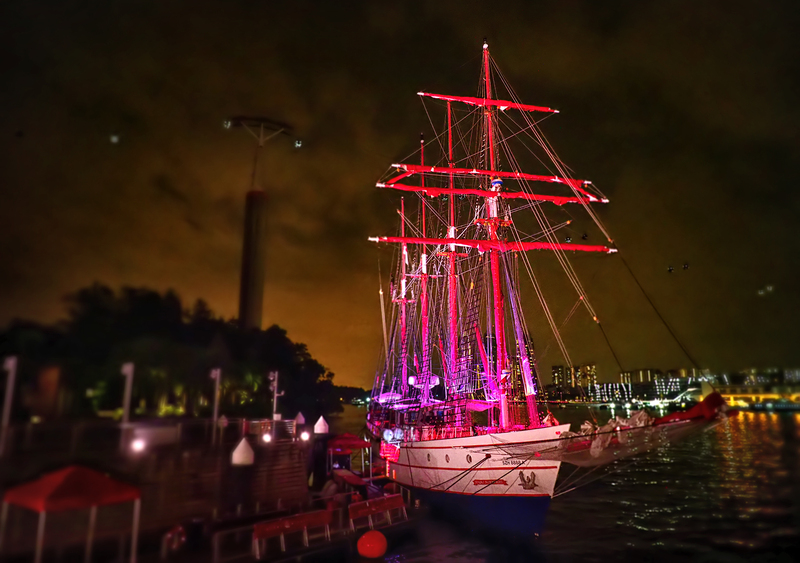 With less than 100 working tall ships left in the world, you come to appreciate the passion and effort that went into restoring the Royal Albatross to its current glory, and sailing it more than 15,000km from North America to Singapore. It is definitely a special experience to be on this beauty, and it does not need to be a special day for one to set sail with her. 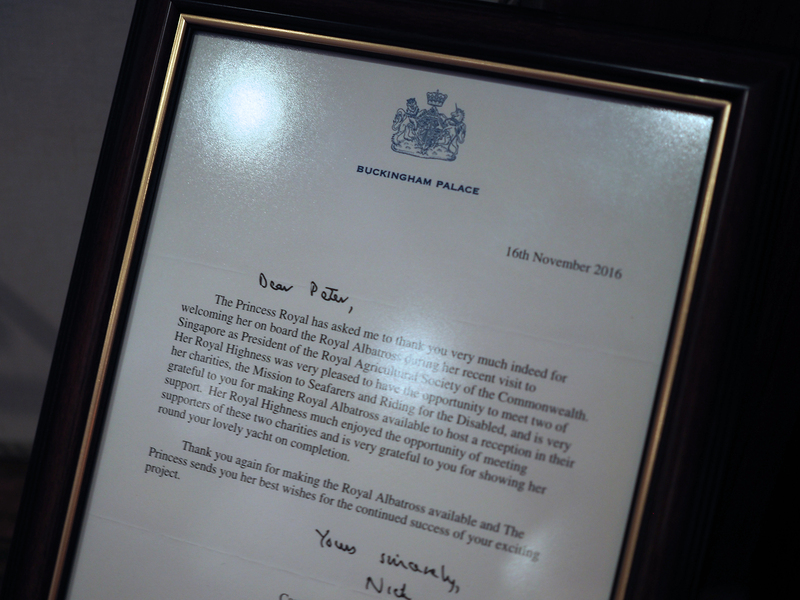 Get more details about the Royal Albatross here. 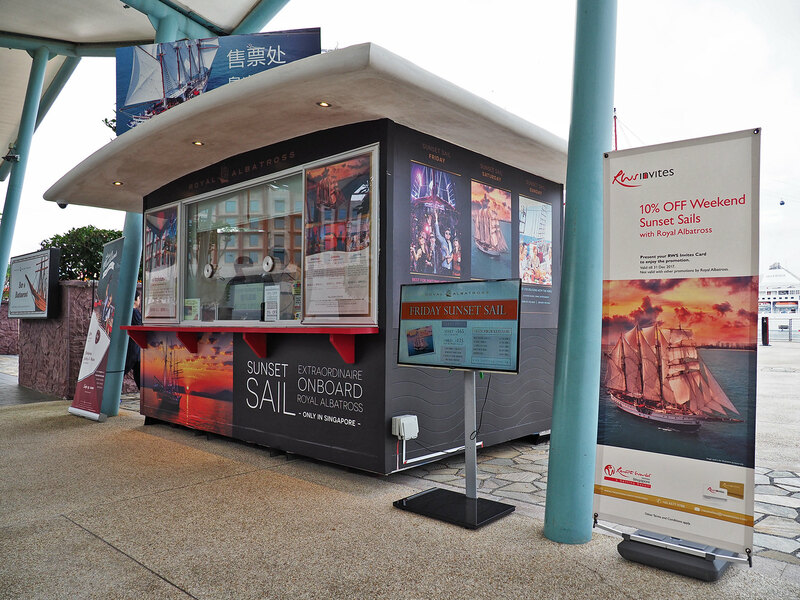 Categories: Travel | Tags: celebrations, cruise, mast climb, MICE venues, resorts world, romantic getaways, royal albatross, sentosa, singapore, sunset cruise, tall ship, unique venues singapore, weekend getaways from Singapore, where to go for a date, wooden ship, yatch charter singapore | Permalink.